The IceCap Eco-Friendly Smart RODI System is a 4-stage reverse osmosis system like no other. It is equipped with a super quiet booster pump which allows the system to run at peak efficiency capable of providing a 2 to 1 waste to product water ratio and upwards of 150GPD* of pure product water making it a very Eco-Friendly reverse osmosis unit. The IceCap RODI unit is fully managed by an unique system controller thatfully automates the entire water purification process and supports a few handy safety features that set it apart from any other system currently in the marketplace. 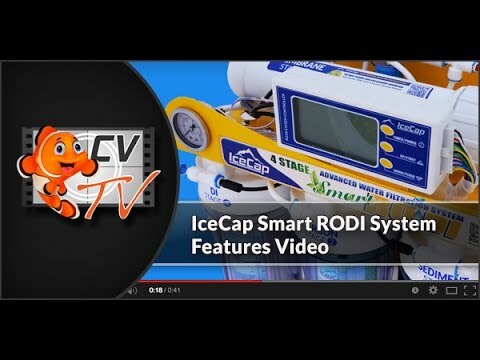 The IceCap Eco-Friendly Smart RODI features include leak detection, system run timer, filter replacement notification, high efficiency and a special ElectroDeposition coating to help protect the steel frame from rusting among many others. CoralVue warrants each new IceCap SMART Reverse Osmosis & Deionization system to the original owner only to be free from defects in material and workmanship under normal use and conditions for a period of 12 months from the date of original purchase. CoralVue liability under this warranty shall be limited to repairing or replacing on CoralVue’s option, without charge. CoralVue will not be liable for any cost of removal, installation, transportation, or any other charges which may arise in a warranty claim. NOTE: This warranty is void if the product is: 1) Damaged through abnormal operating conditions, accident, abuse, misuse, unauthorized alteration or repair. This includes, but is not limited to, failure to regularly replace carbon and sediment filters. 2) Damaged by poor local tap water conditions. 3) Damaged due to connection of equipment other than supplied by CoralVue or modification by the user. 4) Damaged by hot water, freezing, flood, fire, or any act of God. This warranty is valid only in the U.S. and is non-transferable. No other warranties are expressed or implied and any other warranties required by law are limited in duration to 12 months from the day of purchase. CoralVue will not be responsible for consequential damages arising from installation or use of the product, including any flooding which may occur due to malfunction or faulty installation including, but not limited to failure of installer to tighten all fittings. Gallons per day are not warrantied since it is dependent on the users water conditions (i.e., temperature, pressure and total dissolved solids). Can I use standard pre-filters / membrane in this system? Yes, this system accepts standard 10" x 2.5" prefilters / carbons and standard 10" RO membranes. A solid well made unit. It produces lots of high quality RO water and is more efficient than units without a pump. The unit has high and low pressure sensors that will shut it off when there is no water, low pressure, or "tank is full" meaning too high an outlet pressure is sensed. But this really isn't a good way to control the unit as it will keep cycling, turning on and then issuing an alarm, when the water is turned off. If the output side is hooked to a closed valve , I believe that the same thing will happen as there are no check valves to prevent the water pressure from creeping down and causing the unit to cycle. A tank might work, might not. The built in timer on the controller is a one shot deal, it can be set for one to many minutes but after it expires it will not turn on again on a daily basis. That would be a really nice, cheap addition to the unit. On my unit, the timer is buggy and hangs. I set it for 30 minutes to run the new cartridge flush and the time just hung at 23 minutes until I turned the unit off. This happened twice and I gave up on the timer mode. I control the unit by plugging it in to an electric timer that turns it on for 2 hours a day. This works well, the controller starts up or boots in manual mode and then the unit proceeds to filter water for 2 hours when it is unceremoniously shut off. Not the most elegant solution but it works. If the unit loses water pressure (I am on a well) while it is on it won't burn up the pump as it will sense the loss of water pressure and issue an alarm, then keep trying to restart.